A year after starting its direct assault on McDonald's' long-held dominance of the restaurant breakfast market, Taco Bell is adjusting its menu and taking a decidedly darker creative approach in its new round of ads. The first round of ads from Deutsch L.A. made waves by naughtily employing real-life "Ronald McDonalds" to sing the praises of Taco Bell's new breakfast offerings. Those were quickly followed by a humorous spot comparing continuing the McDonald's breakfast habit with continuing to wear a mullet haircut and otherwise being stuck in the past. The new ads from the same agency are also satiric, but in a creepier, heavier-handed vein, in which the (no doubt intentionally over-the-top) implication is essentially that McDonald's is out to turn us all into mindless zombies via Egg McMuffins. The theme and conventions — the heroic, independent spirit rebelling against evil conformity —echo those that have made fortunes with Millennials in books and movies including "The Hunger Games" series, "Divergent" and now "Insurgent." 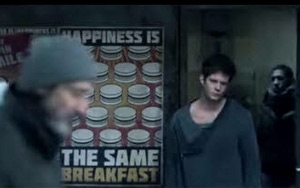 In the Taco Bell version, a clown-faced leader and guards are the oppressors in a dystopian society called "The Routine Republic," where "happiness is eating the same breakfast." Amid the perpetually overcast environs and beaten-down fellow citizens, a few brave young souls become "Breakfast Defectors," breaking out and escaping to the land of Taco Bell. A three-minute video version is being featured on Taco Bell's site and social media channels, including YouTube, as well as shown in theaters before screenings of "Insurgent." A 60-second ad version will debut on TV on (you guessed it) the season finale of "The Walking Dead" on March 29. An animated, short video that is supposedly a propaganda film created by the rulers of The Routine Republic is also online. The latest marketing will also include 15- and 60-second TV spots featuring testimonials from "Breakfast Defector" Taco Bell customers. Those ads will help spotlight a new Taco Bell breakfast item: a Biscuit Taco that's replacing its presumably least-best-selling Waffle Taco (the chain's AM Crunchwraps, breakfast burritos and Cinnabon Delights continue). The Biscuit Taco ($2.49) is a buttermilk biscuit shaped like a taco, with a choice of fillings: sausage, egg and cheese; bacon, egg and cheese; or its new Crispy Chicken (breaded in tortilla chips) with either gravy or a Jalapeno Honey sauce. Taco Bell reported that breakfast has gone from virtually zero to generating 6% of its U.S. business. McDonald's, which had an estimated 31% share of out-of-home breakfast a year ago, now reportedly has about a 25% share.